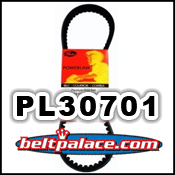 Home > Scooter, Golf, and Karting Belts > Gates PL30701 Scooter CVT Belt 818x19x28. Premium Kevlar Belt. GATES# 98071701. Gates PL30701 Scooter CVT Belt 818x19x28. Premium Kevlar Belt. GATES# 98071701. Don’t be fooled by Auction and “Web Store” sites selling “Standard” belts in place of this true High-Mileage Gates Kevlar PL30701 Premium Scooter CVT Belt. Measurements equal 0.75" x 32.2" (818mm). Gates Belt PL30701. Drive Belt 818x19x28. (Replaces OEM#: 8280102) FOR CARTER and APRILLA MODELS such as: Scarabeo 125 (124cc) 99-06, Scarabeo 150 (151cc) 00-06. We offer 100% Secure Shopping!